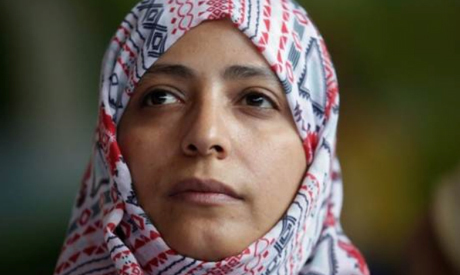 Yemeni Nobel Prize winner Tawakkol Karman was suspended from an Islamist party allied with President Abd-Rabbu Mansour Hadi after she accused the Saudi-led coalition that backs him in the country's civil war of acting as occupiers. Karman won the 2011 Nobel Peace Prize for her role in Arab Spring protests that ousted authoritarian President Ali Abdullah. More recently she has ramped up public criticism of Saudi Arabia and the United Arab Emirates, accusing them of backing a campaign to divide Yemen by supporting southern separatists against the internationally recognised government. Speaking at the Warwick Economics Summit at Britain's Warwick University over the weekend, Karman said Saudi Arabia and the UAE were driven by a "reckless adventurism" when they intervened in Yemen in 2015 after Iran-aligned Houthi forces drove Hadi into exile. The Islah party, regarded as a branch of the Muslim Brotherhood, which is viewed by Saudi Arabia and the UAE as a terrorist organisation, tried to distance itself from Karman and order her suspended from its ranks. "Tawakkol Karman's statements do not represent the Islah party and its policies, and are not in line with the party's positions," a statement posted on Islah's website said. "Therefore, the general secretary has decided to freeze her membership according to the party's status." Karman, who left Yemen after Houthi militia seized the capital Sanaa in a series of military advances that began in late 2014, responded on her Twitter account by describing Islah leaders as "prisoners and slaves" of Riyadh and Abu Dhabi. The Brotherhood denies accusations from conservative Arab governments of involvement in terrorism, saying it seeks democracy by peaceful means only. The southern separatists want to restore the independent state of South Yemen, which merged with North Yemen in 1990. They have fought the Houthis alongside Hadi's forces, but rose up last week and seized control of the southern port of Aden after Hadi refused to sack his prime minister, whom the separatists accuse of mismanagement and corruption.